In my head, we own a house. It's got windows and doors and counters and walls and floors and, well, I need to decorate it. In all actuality, we rent our home (although we actually own two... long story which you can catch here) and I've just got a flurry of ideas in my head about how to design and decorate a fake house. So I decided to pin it all down in a fun series here appropriately title: The Dream House. Today is all about the dining room. While we used to be mainly kitchen table eaters, our little family has really taken to eating at the dining room table for most of our meals lately. You can glimpse into our current rental house's dining room here. It's a small room, but our big table and awesome benches give us enough space to gather. And it's freshly painted, as I decided to paint it by myself at 8 months pregnant last year. Girl's gotta do what a girl's gotta do. 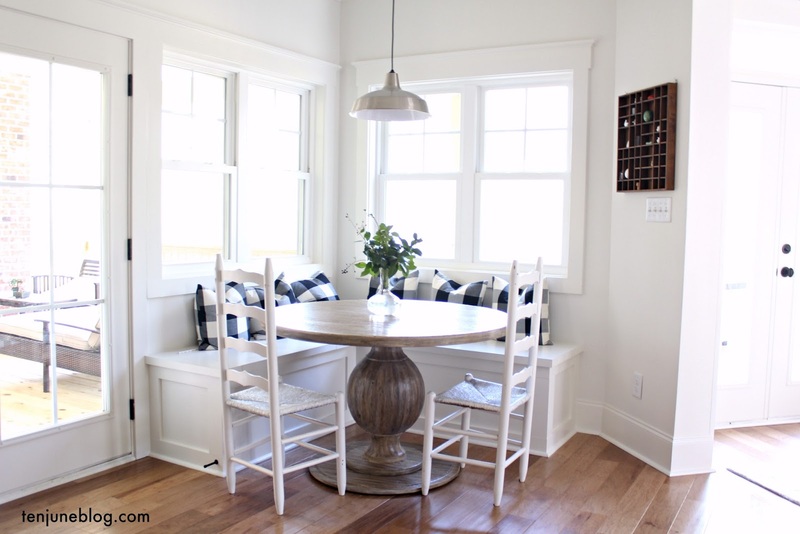 For our next home, I want to throw back to our first home's dining room and work the navy blue paint. Ah, how I miss that dining room! The wall color is definitely going to be the feature in the room and I'll simply add in a bunch of neutrals and pops of my favorite, classic Delft blue china here and there. David traveled a lot to the Netherlands for his previous job, so that pattern is special to us. Not to mention it's so preettttty. I'd love to keep a massive farmhouse table, although with a lighter wood. Maybe I'll sand down and restain our World Market table (which is on crazy good sale right now!)? I also definitely want to keep the bench situation, but maybe spruce it up with some buffalo plaid cushions. We need some storage space in the form of wall shelves and a sideboard, so those pieces are a necessity. I also realized I forgot to add window treatments to the mood board, but I would definitely do something warm and neutral, perhaps my favorite PB velvet curtains? Finally, I want to finish off the room with the custom piece of art I just purchased from House of Belonging (link below). I can't wait to show it to you guys in our rental house, it's so perfect to hang over the spot our family gives thanks each day. 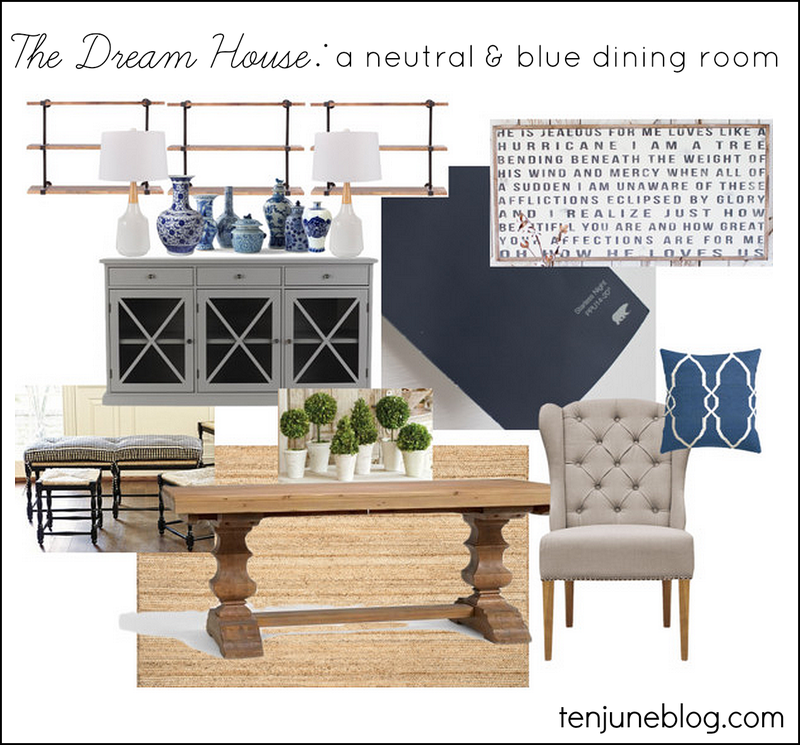 Are you on board with the neutral and blue room? What's in your dream dining room? Um, you pretty much made our dream dining room too! We are waiting to put down hardwood floors before spending the money on table and chairs, etc. Our dining room is a similar color and everything else is our style, love it! Great article thanks for sharing! I love this colour palate very nautical and natural. I love the navy, greys and brilliant whites here! Lovely colour palette!